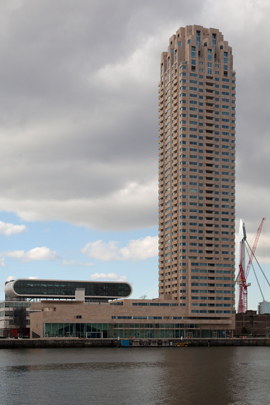 The 160 metre high New Orleans residential tower, with a facade of sand-coloured panels of Chinese granite, was designed by Portuguese architect Alvaro Siza. It has an elegant art deco style crown inspired by the classic New York skyscrapers of the 1930s. The 45 floors contain a total of 234 high-end apartments, varying in size from 65 to 212 square metres; the bigger and more expensive apartments are on the upper floors while the crown houses two luxurious multi-storey penthouses with light wells. Of particular note is the floor height: 2.95 metres. Residents have their own parking space in the underground car park and can make use of such in-house facilities as the four guest suites and the fourth-floor health club. The latter boasts a swimming pool, sauna, fitness room and sun deck on the roof of the low-rise section, which contains the LantarenVenster cinema and jazz club. There is a large multifunctional auditorium on the ground floor and five smaller film theatres on the upper floor.